Welcome to our Olivery! In 2002 we started planting our unique lakeside sites with Olives and Grapes. 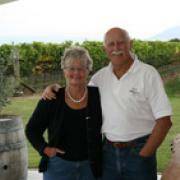 In 2007 w.e had pressed our first Extra Virgin Olive Oils and won a gold medal for our outstanding Pinot Gris. We have recently sold the vineyard and are now concentrated on our Olive Grove. It is our pleasure to welcome you to our "home" on th wbsite, we hope you will enjoy our wines and olive oils as much as we do ! We have two Groves is planted with 2500 olive cultivars from around the world: Barnea from Israel; Frantoio and Leccino from Italy; Manzanillo from Spain; and many others. The olives are normally picked in mid June and cold pressed immediately.